On September 27, 1862, the Hartford Courant published an article about the battle of Antietam focused on the 16th CVI along with a listing of all Connecticut causalities from the battle of Antietam. From this article it is clear that this was likely not the first time that Job Case and his family discovered that Oliver had been killed in action. The article alludes to prior public knowledge of the battle via unidentified “letter writers” and the common practice of the day was to post (or read) the casualty list in a public place. Also, Ariel and Alonzo may have written letters home that arrived in Simsbury prior to this date. Only three days later, the Courant published a letter written by the adjutant of the 16th Connecticut, Lieutenant John Burnham. In his letter, Burnham provided a detailed account of the grave sites of all the soldiers in his regiment buried on the field at Antietam. Among these soldiers of the 16th CVI was the body of Oliver Case buried by his brothers in the same location on September 19th. Burnham noted that each grave was carefully marked by a headboard containing the name and the unit of the soldier. From Alonzo Case’s recollections written after the war, we know that in December of 1862, Oliver’s father, Job Case traveled from Simsbury to the battlefield at Antietam for the purpose of recovering the remains of his son. 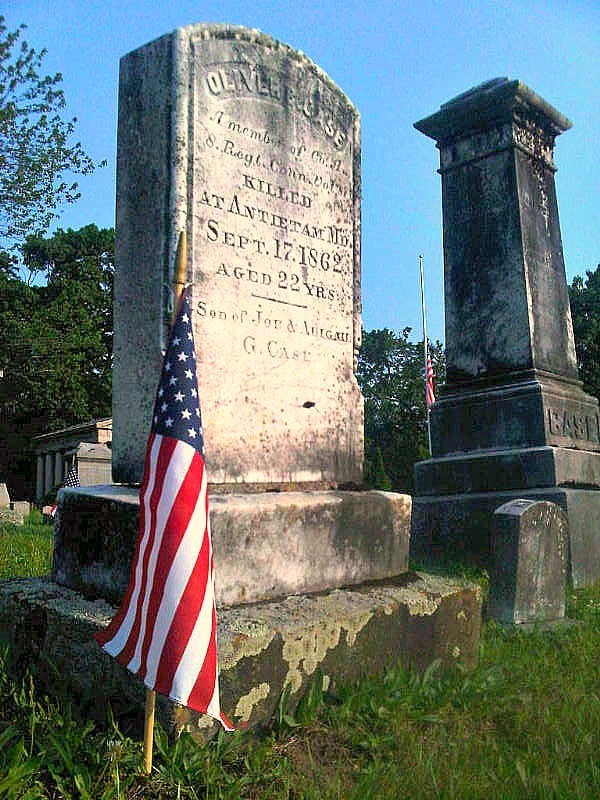 The elder Case may have enlisted the services of a well-known Hartford undertaker, William W. Roberts, who assisted many Connecticut families with returning the remains of their loved ones killed at Antietam (HT: John Banks). Job Case had the remains of his son exhumed from the temporary grave on the Otto farm and returned his body to Simsbury. 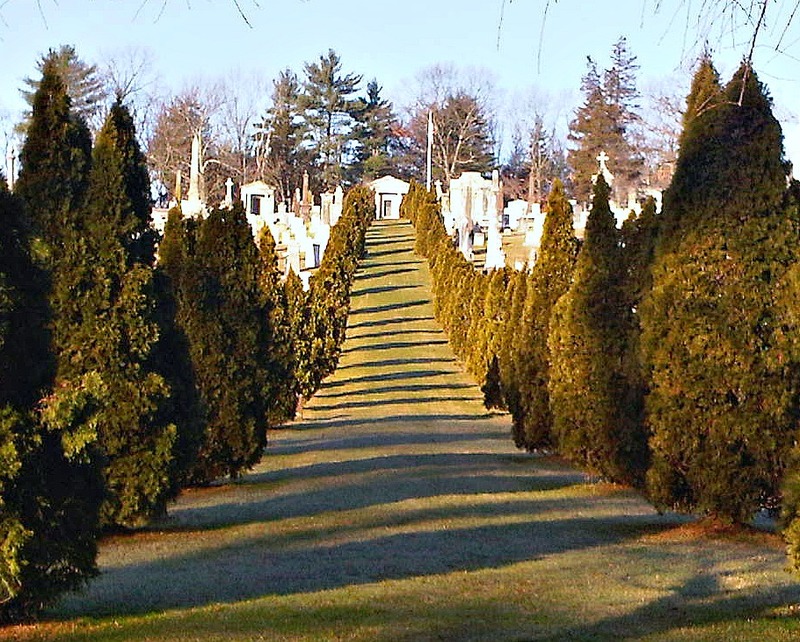 Oliver was laid to rest with multiple generations of his ancestors in the Simsbury Cemetery located in the heart of town. Nearly 15 months after he departed his hometown, Private Oliver Cromwell Case had now returned home to rest with honor. In modern times, two gravestones stand for Oliver Cromwell Case, one at the Antietam National Cemetery and the other at the Simsbury cemetery. 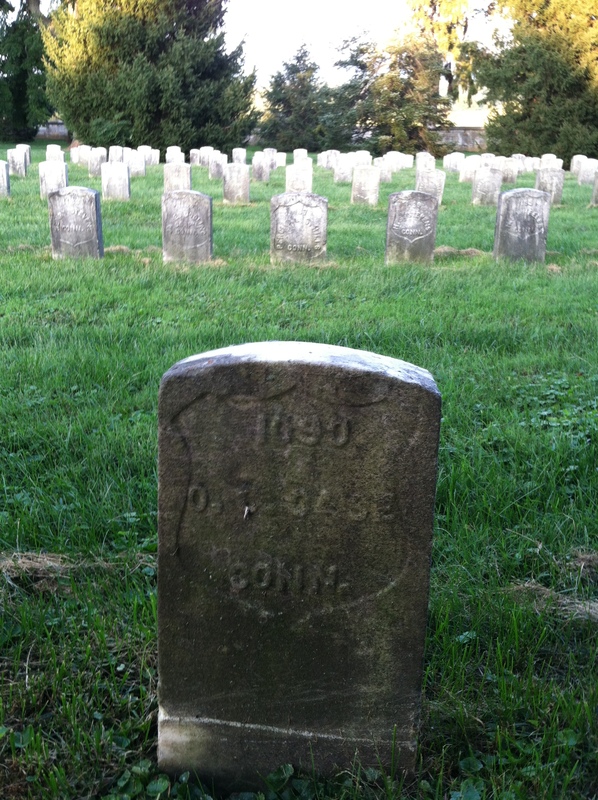 It is possible that after Job Case removed his son’s remains from the burial site on the battlefield in December of 1862 that the temporary grave marker was left in place. Hence, when the removal of the dead soldiers from their battlefield gravesites to the new national cemetery began in October of 1866, the workers may have found this marker and established a grave in the new cemetery even though remains were not present. As described by those who traveled over the battle in subsequent years, many of the dead soldiers’ remains were dug up by swine feeding in the fields. This means that the absence of actual remains may not have been considered unusual by those teams exhuming the bodies for burial in the national cemetery. In fact, the remains of an unidentified New York soldier were discovered by a park visitor in October of 2008. However, the official report on the establishment of the cemetery creates the impression that each deceased soldier was properly identified before his internment in the cemetery. This entry was posted in Death and Burial. Bookmark the permalink.